Naturally, being a first-year philosophy student at the time, I riposted in the style of CEM Joad: “Well, I suppose it all depends what you mean by ‘heat’, and what you mean by ‘room’…” (ducking smartly as I did so to avoid the incoming engineering textbook). Apparently the (engineering) answer is that you turn the fridge up to full power and leave its door open. Viewing the fridge as a ‘black box’, this will maximise the energy going in in the form of electricity, as the fridge struggles to cool its interior, and thus result in the maximum output in the form of heat. The next philosophical answer was “What kind of idiot sets out to heat a room by using a fridge?”. I ducked again. I thought of this again today when I read that the Shadow Environment Minister, Lord Taylor of Holbeach, is concerned that, as conventional incandescent light-bulbs are phased out and low-energy fluorescent ones become compulsory, it will cost people more to heat their homes. The physics of it may be sound – in a comment on a previous post (long ago and far away), bnitz observed that 95% of the electricity which actually reaches the light-bulb comes out of it in the form of heat rather than light – but it does rather smack of heating your house with a fridge. However, my concern with low-energy lightbulbs is a different one. If our local waste disposal centres are anything to go by, there is little or no provision to prevent dead low-energy bulbs from going into landfill rather than being recycled. This is an issue because of the bulbs’ mercury content, which far exceeds the European Waste Directive’s levels for acceptable landfill disposal. Indeed, current UK recommendations are that if you happen to break a low-energy bulb in your house, you should clear it up only under well-ventilated conditions and preferably wearing a breathing mask. Nice. In practical terms, this means that the average householder will either have to accept the fact that their local waste disposal centre will put low-energy bulbs, unsorted, into landfill, or will have to find somewhere (presumably involving a longer drive) which does sort and recycle the bulbs. For all the years of talk of ‘joined-up government’, this looks like one of those depressing instances where the headline policy looks good, but the practical implications have neither been thought through nor catered for in terms of legislation or funding. The eagle-eyed among you may have noticed a minor change to the layout of this blog. 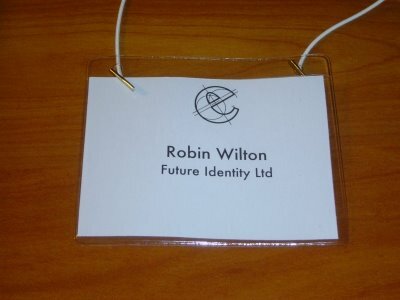 In the sidebar I’ve added a link to the new Future Identity website, which I have set up to give people some more information about the new company, its aims and what it can offer. I’ve put a couple of recent white papers on there already, and hope to add reports from consultancy engagements as that becomes possible. Have a look around the site, and do let me know if you find anything which is broken. Also, a quick note about “Following” the blog. I was going to remove the “Followers” display, as I felt a little uneasy that opting to ‘follow’ the blog resulted in your details being displayed. However, it turns out that I don’t have that option… if I remove the “Followers” gadget you can’t ‘follow’ the blog. The good news is that when you opt to ‘follow’, you can specify that you want to do so anonymously, in which case you won’t show up in the side-bar. So please feel free to continue following, and remember that you have the option to do so anonymously if you prefer. I have also added the “Subscriptions” gadget which will allow you to subscribe using various standard feeds. I don’t think I’ve ever used the phrase “blogging up a blue streak” before, but there’s always a first (or now) a second time: over on his ComputerWeekly-hosted blog, Toby Stevens is blogging up a blue streak. Well worth a read, too, if you haven’t been over there lately; lots on public sector data breaches and Freedom of Information. Highly recommended. As we enter, almost simultaneously, the Obama presidency and the Year of the Ox, Someone Who Shall Remain Nameless was kind enough to point out that Obama and I are close enough in age to share the same sign (in both astrological systems). and they assumed I was a journalist from the mammary-obsessed tabloid newspaper. It’s still my name, but this time the one under it is my own company. It must be real…! In the meantime, arriving yesterday on Barack Obama’s first day in his new job gave me a chance to listen to the radio reports about what he did during the day. To a notable extent, the day’s activities were clearly choreographed to send a carefully-weighted series of messages: he went to church; he held an ‘open house’ reception at the White House for 200 friends; he ‘requested’ the suspension of trials at Guantanamo (though presumably it would be a brave military judge who decided to ignore a request like that…); he met military chiefs of staff to discuss the withdrawal of combat troops from Iraq, and had closed-door sessions on the economic crisis. He also announced new government transparency measures, and added to the ‘transparency’ theme by saying that White House staff on more than $100,000 would have a pay freeze while the economy is in trouble. In parallel with this, the White House website was overhauled and used to re-inforce the President’s commitment to Communication, Transparency and Participation. Electronic media continue to be an important part of Obama’s approach, including his insistence on keeping his palm-top email device. He was quoted in one radio piece, saying that he ‘didn’t want to be getting advice just from those people who merely worked for him’, and that he wanted ‘someone in Chicago to be able to email or text him if they thought he was getting it wrong’. That, in particular, made me smile at the memory of Gordon Brown reportedly phoning someone at home at 6am. “Luckily the man was a shift worker and was up at the time”. By some definition of “lucky”, perhaps. I hope Obama manages to live up to his promises of transparency and communication in government, but it may not be easy. One reason his advisers didn’t want him to keep his personal email device (as well as the encrypted one he’s been issued with for work) was because of concerns that if there is work-related traffic on it, it is likely to be subject to Freedom of Information requests. So presumably easier just to keep the two sets of traffic completely separate (as Sarah Palin would no doubt confirm, in hindsight). Meanwhile in Westminster… former cabinet minister Peter Hain was criticised for “serious and substantial failures” in not registering donations to his failed leadership campaign, and justice secretary Jack Straw was found to have been in ‘clear breach’ of the same rules, having been reminded in 2006 and 2007 that he should have registered a donation received in 2004. It probably was not a good day for MPs to try and vote themselves exempt from having to publish the receipts of their own expense claims. You may recall that back in December I heard that a paper I co-authored with Susan Landau and Hubert Le Van Gong had been accepted for presentation at the 2009 Financial Cryptography and Data Security conference. I’m delighted to follow that up by letting you know that you can find a copy of the paper here, on Susan’s site, or here, on Hubert’s. The article, “Achieving Privacy in a Federated Identity Management System,” is from Financial Cryptography and Data Security 2009. ©2009 Springer. Personal use of this material is permitted. However, permission to reprint/republish this material for advertising or promotional purposes or for creating new collective works for resale or redistribution to servers or lists, or to reuse any copyrighted component of this work in other works must be obtained from the publisher, Springer.